As I set my altar for this journey, the first art I made as a co-researcher on Barbara's dissertation research team became the central piece. This multimedia piece created on a square board was made from an early 1800's map of the West Coast of the British Isles, thick hemp string, and found shells from the beaches of Southern England where I grew up. I placed a doll from our January 7 Gestare retreat day on the altar to accompany me on my journey. Dropping into the art I began a journey of inquiry into my ancestral origins. Sounds and images came forth from those ancestors of blood and name who were merchant sailors, traders of fine glassware in the 1800's. Ancestors about whom I know nothing but this one story. Ancestors of whom we never spoke. M: So as I saw you with your load today and was riding beside you out to the Cemetary site, I noticed you were like an outdoor hiker, with back pack (video pack around your waist) and with tripod stuck into the pack's strap, and you were well dressed for the cold-- off to? And I thought to myself she is going to her art/spiritual practice for the day. How do you respond to that? B: Yeah, it is definitely a commitment. To do something I made an agreement to do with other women artists who I practice with. Doing it at the same time frame, even if they are in another country, in another time zone. I prepared a few days before, deciding where I was going to go, getting my equipment ready. Very loosely thinking about what I'll do when I get there. I envisioned it because I know that landscape. 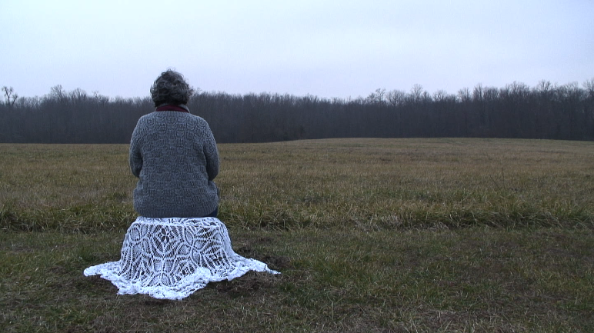 I would sit on the tree stump and put my great grandmother’s crocheted fabric on it to sit on. It's all setting the stage. The altar. I have thoughts arising about my collage making idea for my now finished dissertation and oral exam - 2D artifacts, honouring my completion. I realize it’s the ritual “feasting” of these trances, the artwork is in this process (beyond this writing), generating a Dakini mandala of the colours blue, yellow, red, green, and white with separate pages. “Make the collage.” Trance ends. Nané Jordan (2012). Post-PhD collage. Images of my family, dissertation study participants, text from dissertation, found magazine images and art. This website is copyright of Gestare Art Collective, 2017. All rights reserved.